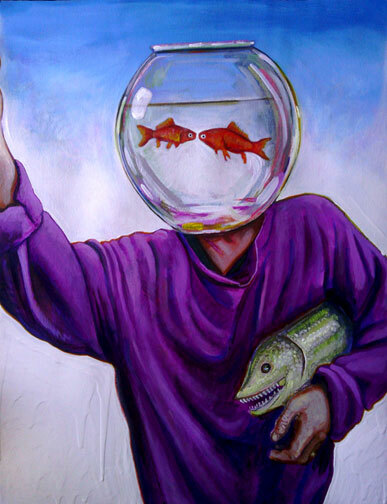 This entry was posted in Paintings - Pinturas and tagged 2-d art, acrylic on paper, artist on wordpress, Easter, figurative painting, fine art, fish, fish bowl, Gabriel Navar, goldfish, lukisan, Malerei, Oakland, painting, peinture, pintura, pittura, visual art. Bookmark the permalink. Hi Harlon, thank you once more… one day, I’d like to visit Canada (but certainly during Winter)!. Gabriel Navar is the epitome of traditional art! He not only has amazing compositions and great brush strokes, but his ideas are unique and qualifying of post modern culture. You’re welcome. I love the arts. I use to draw and paint a lot growing up. And sometimes, I still do. Just not as often as I use to. You’re work is just very inspiring. I lived in Gardena, CA for about 10 years, but I now live in Orlando, FL. Much luck with everything Gabriel. We’ll definitely keep in touch. If you happen to have an exhibition in the area, let me know and I’ll be honored to attend.